Dice the fish and season with salt and pepper to taste. Grind in a food processor with the breadcrumbs, 1/2 onion, garlic, parsley and egg until you have a thick paste. Create the meatballs in the size you want. Fry in a pan with oil over medium heat to seal. Remove and place on a paper towel. Sauté the onion and garlic in the same pan for 2 minutes. Raise the heat to medium-high and add the sauce, tomato, peppers, oregano and salt and pepper to taste. Lower the heat when it starts to boil and add the meatballs. Cover and cook for 10 more minutes. Add the paste and carefully mix so as not to break the meatballs. Use the pasta you prefer in place of the spaghetti. You can add broccoli or asparagus if you like. This easy fish meatball recipe is perfect for Lent as an appetizer or main dish with white rice or pasta. 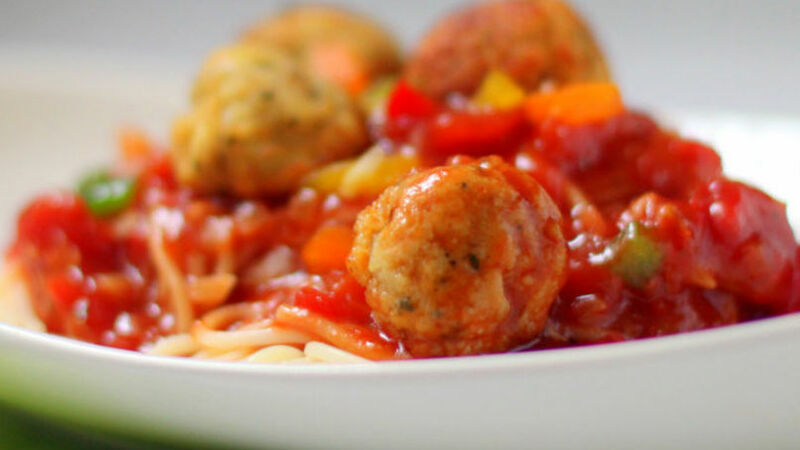 Meatballs are a great way to get kids to eat meat or fish. Best of all, they're easy to prepare and everyone will love them. I prepared this dish with mahi mahi because it's my favorite.